I have been brewing for decades and cooking... well... we have a growing family so that's a necessity, especially the traditional English Sunday roast dinner. If like us, you cook a roast regularly then try the roasting calculator which will work out all your cooking times for you perfectly. This is what we use to keep things simple. Most of my brewing is now done using produce from our orchard, and harvest season usually means all hands to the pumps to bring in the damsons, plumbs, pears and apples. 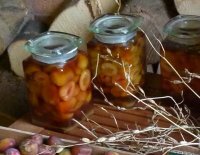 So if you want to know what to do with your apples, pears, damsons or plums have a go at one of the recipes below - they're simple, easy going and you won't be throwing away rotted fruit every year! Cook traditional Sunday roasts our way. This calculator automatically works out the recipe & cooking times for perfect results. 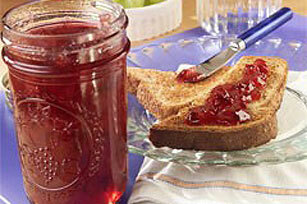 How to make a very old style of jam, very simply. This old family recipe is amazing. Old School Plum Chutney - Perfect with a curry! 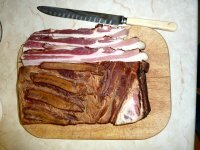 Traditional Dry Cure Bacon - make it yourself! Very easy recipes for parties and a great gift too! 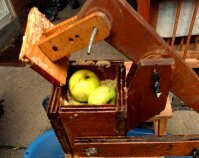 Build your own equipment and make your own delicious cider from your own apples. 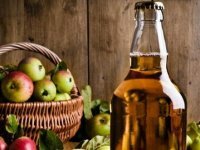 Simple home brew recipes I've used over the years. When I want a quick and easy brew, there's nothing better. 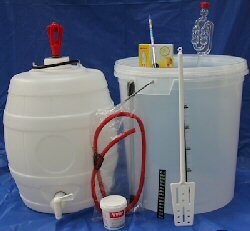 Build your own equipment and make your own delicious pear cider from your own pears. 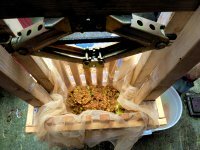 How to make a very decent press from spare wood and a car jack.